You’re too young to be a blacksmith. There is a certain amount of audacity that is required when one is about to embark on a career path that is better suited for medieval times. Although, looking back, that audacity was born more from a naïve innocence of the task ahead than of anything close to pride. I simply had a passion for blacksmithing. That passion was propelling me audaciously toward three main goals. To do my part to preserve and resurrect the art of blacksmithing. To become the best blacksmith that I could possibly be. To create things with the art of blacksmithing that no one had ever created before. And so it was with these clear goals in mind that I set forth from the village of Crawford Bay to Fort Steele Heritage Town where I became “The Village Smithy” at the tender age of 20. Fort Steele is a beautiful living history museum set at the edge of the Rocky Mountains in the southeastern corner of British Columbia. The town has many historical buildings some of which are open for visitors to explore with the help of museum staff who play the roles of townspeople from 1898. I was hired to be the interpreter of history in the blacksmith shop. 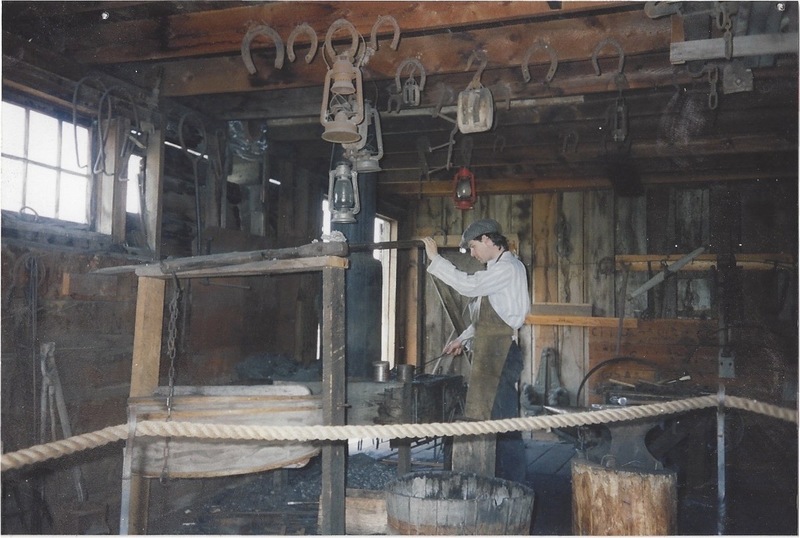 The blacksmith shop had been vacant for seven years, so the museum was quite excited to finally have a blacksmith again. 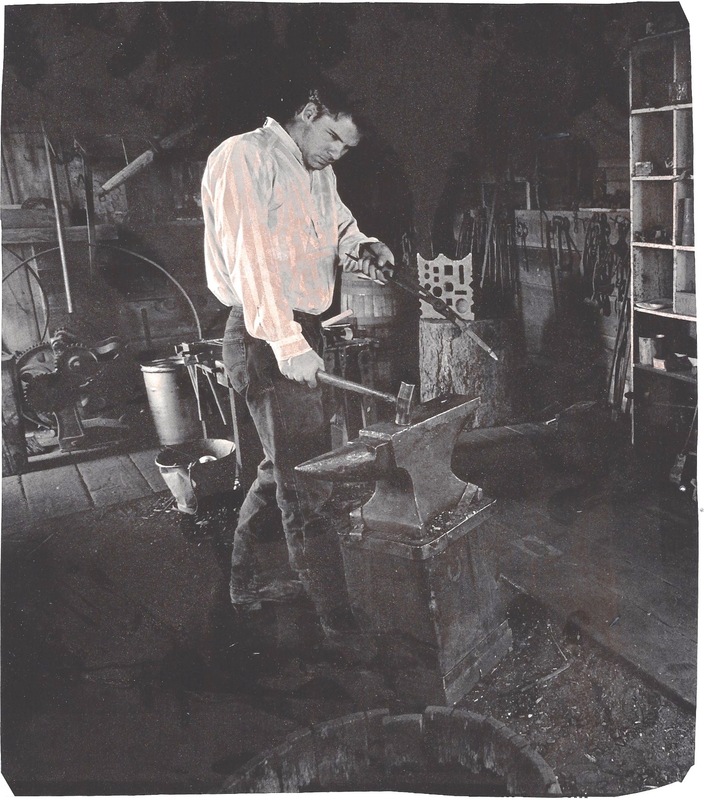 Blacksmithing was also one of those historical crafts along with the leather shop, the tinsmith, and the bakery, where museum visitors had the opportunity to see people practicing their skills without the use of electricity, using techniques that have been passed down for generations. These historic craftspeople supplemented the cost of running the museum by creating items that could be purchased by visitors. Unfortunately I had no idea that I was going to be upsetting to the historical sensibilities of the visiting public. Most people, when they think of a blacksmith, think of some wizened old man who can barely stand hunched over an anvil making a horseshoe. I, on the other hand, was a handsome and charming young man (tongue-in-cheek) who was making handcrafted household items that were both functional and beautiful. Nearly every person who came into the shop was very confused. They would first exclaim, “you’re too young to be a blacksmith”, then they would proceed to ask me if I was making a horseshoe. The older generation was the most deeply offended. They could not believe that I had the audacity to not be old and to not be making horseshoes. Even though there were hundreds of items in my blacksmith shop that would have been made by almost any blacksmith in the 1890’s. The general public had (and still has) it firmly solidified in their mind that blacksmiths only make horseshoes. It even became very humorous when well-meaning parents would come into the shop, point at me and tell their children, “Now you see that man there – he’s making a horseshoe”. I was clearly not making anything that even remotely looked like a horseshoe – for example a Dinner Bell triangle. And so my first goal of resurrecting and preserving the art of blacksmithing began unexpectedly, by educating the public that blacksmiths make many things, most of which, are not horseshoes. This has continued to be one of my main goals in life – to educate the world that blacksmiths, for the most part, do not make horseshoes. I even have a wonderful bumper sticker that was made by my friend Mark Pearce who is also a blacksmith. It’s says, “Yes I am a blacksmith …….. No I do not shoe horses”. Paul, I think the Harness Maker next door threw the public off – he was OLD!!! Your great post brought back some wonderful memories and your pictures are how I remember you, focused, intense and oh yeah, handsome 😉 charming?, meh!